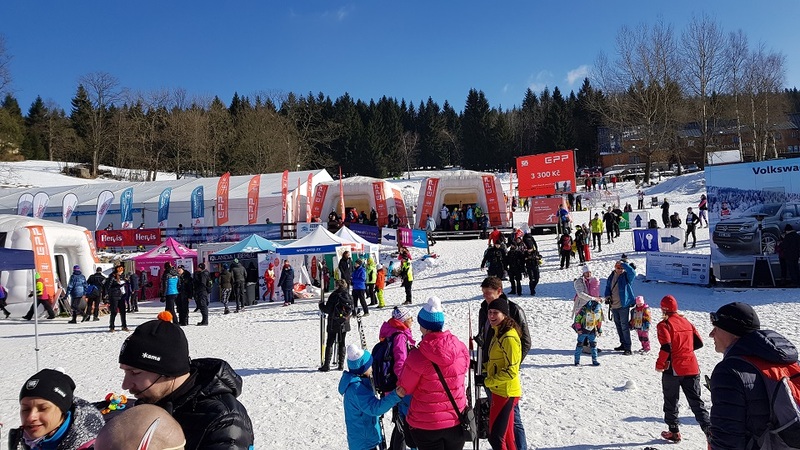 Three days of skiraces, classic and skate, many participants and a good skiarena. Yes, Jizerska is good. This year the weather was also good or did you notice? It’s when weather is bad people notice. Temperatures where around minus 5-6 to almost zero degrees each day (degrees celcius, we are in Europe). Skiarena in Bedrichov where start and finish are, is about 10km from Liberec centrum. On Saturday and Sunday there are shuttlebusses for participants and later on spectators. The skate race on Friday starts as late as 13:00 and we drove our own car to start. Parking should be plenty we were told but when we showed up, not late, we searched a lot to find a parking spot. I don’t think we were allowed to park where we ended up but we had to, race was on. The skate race was 30km and not that many skiers, around 500. Good thing it was no more because the tracks were often wide enough only for 1.8 skiers skating, not two. So varying rude passings were made every now and then. To top it off: one skier NOT participating in the race told me to get out of the track because he was skiing faster than me. WTF?! With many skaters and narrow tracks the uphills got softer snow and made uphills even more hard. Espacially this non-stop 6km uphill after the 7km mark. After that part the tracks were pretty nice and easy. The view you get in this kind of tracks is a lot of trees. Dens forest. It is a lot of forest roads you are skiing on. With snow on trees it was a christmas postcard scenary. A little more mountain views and oversights would have been nice. Each WL race is different, different taste and format. 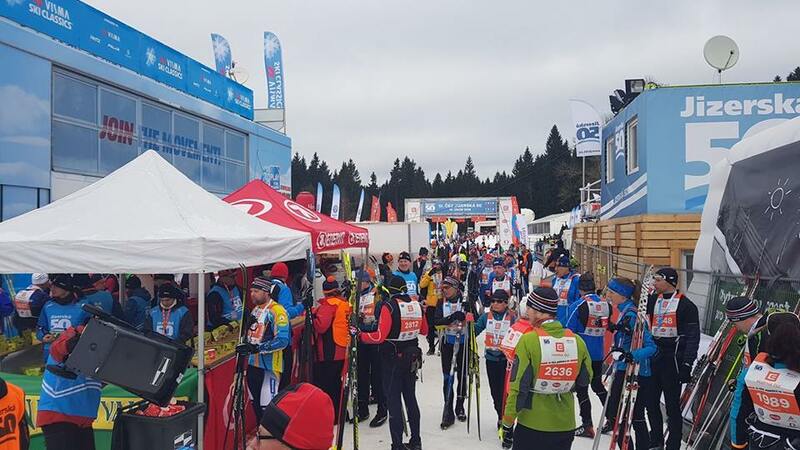 The main 50km classic race on Sunday had a lot of skiers. Maybe not a record or maybe it was. Good weather again. One recommandation I would like to give the arrangers is to widen up the first few kilometers of track. It is just to narrow for this many skiers. With more wide tracks the skiers levels would even out faster. We ended up walking in line for a long time. Elite skiers get less walking in line, good for them. In finish area we got a big glass medal that got very visible on my trophy wall back home. Food for evey skiers is included in start fee. All races should have that. I have seen some marathons that only offer cold fruit drinks in finish and you have to buy warm food. Three different meal were offered. All good, I think, because you only got one. The queue lines to get food were not noticed on the short races on Friday and Saturday but on Sunday these lines were very long, miles it felt like. From one end of the long eating tent, to the other end and then back again! Wow. Some people just skipped that line and bough warm food on one of the stands outside. Please add more capacity to the food serving. 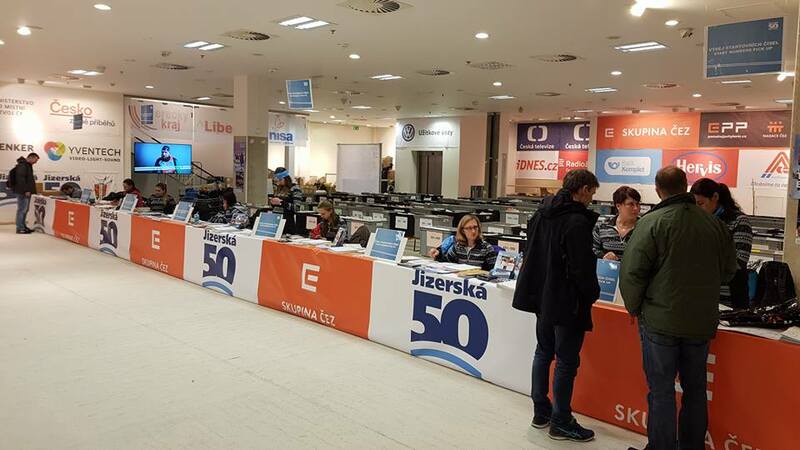 Jizerska is a good race destination. Several races, good races, good ski arena and very low prices. Go to a restaurant, eat and drink beer all you can and you’ll see the low prices compared to other nations. Hotels and busses are also very cheap. Compared to other WL races this is a very cheap trip BUT just as good as any WL race destination. Value for money is what we call it. Worldloppet Reception on Friday evening was very nice. Nice food, nice people. “The best reception” as Boris said to all. This entry was posted in Race reports 2018. Bookmark the permalink.